Rick and Tammy Tiedtke and Kate and Curtis Mirise attended Selover Library’s Perennial Plant Swap and went home with some new additions for their gardens. CHESTERVILLE — Perfect spring weather greeted the fifty gardening enthusiasts who attended Selover Library’s annual Perennial Plant Swap on May 7. Generous gardeners filled the library’s back parking lot with perennials to share. Everyone went home with something new to beautify their gardens. Carri Jagger of Morrow County’s OSU Extension Office led off the program with a talk on how to care for gardening tools and divide plants. She advised gardeners to wash off the roots of their new perennials to prevent the introduction of weeds, and invited attendees to consider the upcoming Master Gardener class offered by the Morrow County Extension Office. Jagger, along with Master Gardeners Merry Tapp, Darlyn Shumaker, and Kathy Duffy, identified the available plants. They also answered questions as attendees picked out plants to take home. Along with the truckload of plants he brought to share, gardener Robert Day donated a planter with sedum for Selover Library to give as a door prize. 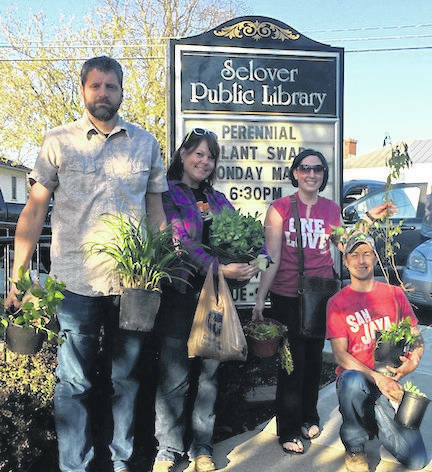 This was the 10th straight year that Selover Library has hosted the Perennial Plant Swap. Selover Director Suzi Lyle noted that whereas the first year the perennials shared were limited to hostas and daylilies, she was amazed by the more than 25 varieties of plants available this year. The number of people attending has also grown, making 2018 the most successful event yet. https://www.morrowcountysentinel.com/wp-content/uploads/sites/29/2018/05/web1_1-sign.jpgRick and Tammy Tiedtke and Kate and Curtis Mirise attended Selover Library’s Perennial Plant Swap and went home with some new additions for their gardens.